Eight Reasons Arbitration is Better Than a Jury Trial | Gardi & Haught, Ltd. Most plaintiffs in a personal injury case are not aware that there are two courses of legal action to consider if their case cannot be easily settled: arbitration vs. jury trial. Your main concern will be healing of your injury and financial compensation for harm done. However, if you are unable to settle your case easily, arbitration can be an advantageous alternative to going to court. What is arbitration? Arbitration is a time and money saving alternative to jury trial that can get the same final outcome. In an arbitration, your case is brought before a retired judge or panel of attorneys and you receive a decision from them instead of a courtroom, judge, and jury. Contrary to what you may hear, arbitration doesn’t keep plaintiffs from getting “their day in court,” or force a plaintiff into having his case decided by insurance-friendly judges. Arbitration awards can be just as generous as those in court – once the savings for time and litigation costs are taken into account. Usually, the plaintiff will also get to be testify and be heard. The difference is the efficiency and savings in legal costs, witness testimonies, etc. that are realized when a client chooses arbitration over a traditional jury trial. Just like plaintiffs, insurance companies also see a cost advantage. They will often schedule several arbitrations over a short time period, and this will keep their legal fees down since they usually pay their attorneys by the hour. 1. Arbitration can commence much sooner than a jury trial. The time it takes from the day you file to the day you have your case heard in arbitration can as short as six months. For a jury trial, it is typically no sooner than 1-2 years. 2. Arbitration decisions are much faster than a jury trial. While a jury trial may take place over several days, weeks, or even month, most arbitration hearings take less than a few hours. It may take months to get on a judge’s docket for a trial but arbitration can be scheduled as soon as all evidence and testimony is collected. A decision is usually returned within weeks or even days of the arbitration hearing. 3. Arbitration gets your “whole story” in front of the judge. In a courtroom case, the judge acts as a filter for the jury, giving them only the evidence and documents that they deem important. In arbitration, a plaintiff can tell their whole story and not be limited by what a judge deems admissible and inadmissible. Of course the judge will self-limit what he or she considers in their decision, but at least you know that everything was heard. 4. Arbitration is more convenient for presenting medical testimony. Unlike a courtroom situation which relies on live witnesses or video depositions, plaintiffs can submit medical records and reports from doctors and surgeons in an arbitration. This eliminates unnecessary waiting to make it onto a doctor’s schedule, as well as the cost of having the doctor make an appearance in court. Also, the arbitrators deciding these cases tend to be experienced and more knowledgeable with regards to medical testimony and terminology, so there is less chance of misunderstanding and confusion. 5. Arbitration is binding. Both parties agree on the parameters of the award beforehand, most notably the high and low end of the award. Both attorneys also agree to abide by the decision. There is no appeal process and no unreasonable delay in collecting an award. An exception to this is in the case of personal injury through workmen’s compensation. These agreements are non-binding by law so if either side is unhappy with the verdict, they can have it reviewed by a panel of commissioners, following a specific appeals process. 6. Arbitration judges are identified ahead of time. In Cook County, you often do not know who your trial judge will be until the morning the trial starts. For arbitration, you will know who the arbitrator is and you have a choice if you would rather use someone else. This may be helpful for an attorney in preparing your case if he/she has worked with a judge in the past. 7. Arbitration is less intimidating. Instead of facing a stiff courtroom filled with people to give your testimony, plaintiffs in arbitration sit across a conference table and tell their story face to face to the judges. For people anxious about testifying in court, this can be incredibly advantageous. 8. Arbitration is Good for Complex Litigation. Sometimes cases involve several parties with no clear negligence, for example, in the case of a construction site accident involving several contractors. 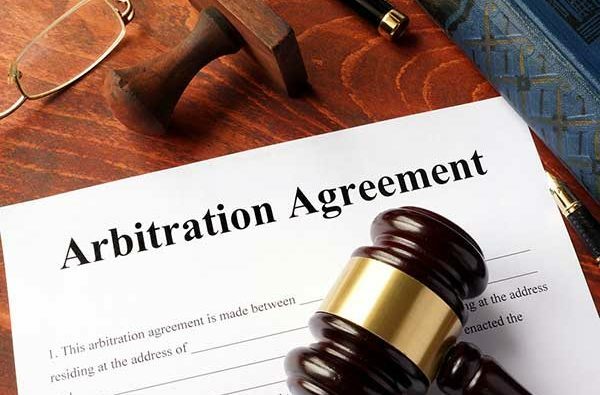 In these cases, arbitration can efficiently bring them all together to work out a global settlement which can save years of litigations and thousands of dollars in court costs. At Gardi & Haught, Ltd., we see arbitration as an important tool in settling personal injury disputes. We can be helpful when trying to determine the advantage of arbitration vs. jury trial and will work to obtain the most favorable settlement for your case. Contact us for a free consultation by click on the free case evaluation button below.